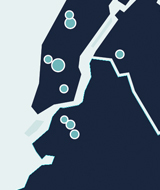 A story of NYC subways, big data and YOU! Student MetroCards are distributed by schools to eligible students from kindergarten through twelfth grade. It's easy to figure out where kids with student MetroCards go to - they go to school. But where else? We decided to take a look. Below is a snapshot of the top ten subway stops where Student cards were used from March 3-9, 2012. If you think you know why a particular station is visited so heavily by students, send us an email at data@fabernovel.com - we'd love to hear your insights! Where do students go versus people with senior/disabled passes? Where do 7-day pass users go versus 30-day pass users? We took a look to see what we would find. This is for from March 17-23, 2012. (source)Students/Senior citizen and 7-days/30days are on differente scales. 1.6 Billion Rides is an inquiry into how we can use big, public datasets to get a better picture of the world around us, and make that world work better as a result. With more data available each year from organizations like the NY MTA, we can use it to better understand and improve the systems that we rely on to make our cities work. Eventually, with the right access to the right data, we can build new services that go beyond what we can even imagine today, allowing us to all make smarter decisions, as individuals and together as cities. To get in touch with faberNovel to discuss this and other data projects, write us at data@fabernovel.com.